Just like you, we love getting out and getting our hands dirty. We love the feeling of getting a job done well, and if we save some money in the process, all the better. We talk a lot about tools here, too, but the other thing we talk up is safety. Working outside or in your garage puts you around some things that can be dangerous if proper precautions are not taken. This is why we recommend safety products right along with the tools and accessories for your car and garage. Our goal is for you to enjoy your time in the shop, being productive, sure, but being safe as well. It bears mentioning that if you are shopping for steel toe boots either for work or home, all our advice is just as applicable. Today’s topic is one near and dear to our heart — or make that feet! Steel toe boots! Working anywhere exposes you to the possibility of dropping something on your foot. If that something happens to be heavy, you could be injured quite badly. A foot injury is nothing to trifle with; think about how much you use your feet from the moment you get out of bed in the morning until you fall into bed at night. Out in the garage, you have all kind of things your feet need protection from, ranging from heavy tools to your car itself (we once had a Mercedes slip off a jack and land on our heel)! Your feet can also be exposed to injury from machinery such as your lawnmower, whirling power tools of all sorts, and other hazards like flaming torches and flying hammers. Thus we recommend steel toe boots when you’re around all these dangers. Don’t be dismayed; selected properly, steel toe boots can be quite comfortable, and even a little stylish. There are both women’s and men’s sizes for easy accurate fitting. They can provide great support, reducing fatigue on those long, hard days you put in. So do yourself a big favor, buy a quality, well-designed, and comfortable steel toe boot, and be sure to wear it! 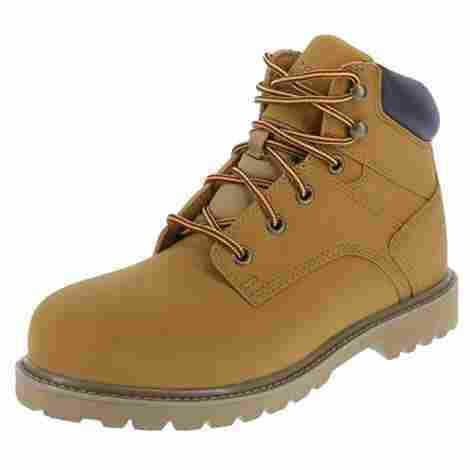 This a 100% leather six-inch boot with a protective steel shank and oil-resistant sole. It features non-slip tread to keep you firmly in place during heavy activity. A plush, padded collar keeps your ankles comfortable all day! If you're looking for the best, this is it. The name Caterpillar is known world-wide as a synonym for strength and power. These steel toe boots carry that tradition forward with quality workmanship and materials that work as hard as you do! You'll enjoy slipping your feet into these comfortable, durable boots. You'll have them for years, as they are known to wear like, well, steel. Safe and comfortable, some consumers have said they look almost too good to be a work boot. Looking good, feeling good, and safe from accidents, that's you! The Caterpillar ST-M steel toe boot comes in black, dark brown (illustrated), tan, honey, and honey nubuck. Sizes available range from 7 to 14 (US). Wide widths are available in most sizes. Sizes are accurate. You are sure to find a look you like, and the right size you need. We rate it highly for its ability to form almost a custom fit to your foot. This a moderately priced boot. Cat quality does not come cheap, but these are no more expensive than many competitors. For the price you will get a boot that will last you for years in the toughest environment. Construction, demolition, oil fields, this boot has seen it all. Do yourself the favor of bringing home the best you can get, at a very reasonable price. You will not be disappointed with the Caterpillar ST-M steel toe boot. This Timberland Pro Pit Boss six-inch steel toe boot is a comfortable, durable work shoe that meets ANSI standards. The non-slip, oil resistant sole will give the traction you need, and a padded top collar means 24/7 comfort. A wide range of sizes in three colors is available. This is a quality boot that will serve you for years. The Timberland Pro Men's 33031 Pit Boss boot is made of high quality materials, from the 100% leather upper to the non-slip, non-conductive sole. The boot has a roomy toe box to keep your feet feeling good from morning until night and beyond. Timberland has been making boots since 1973, and they have mastered their art, as these boots demonstrate. Not cheap but affordable: that's what we can say about most any good-quality product. Pricing is right in line with other widely available products we looked at. 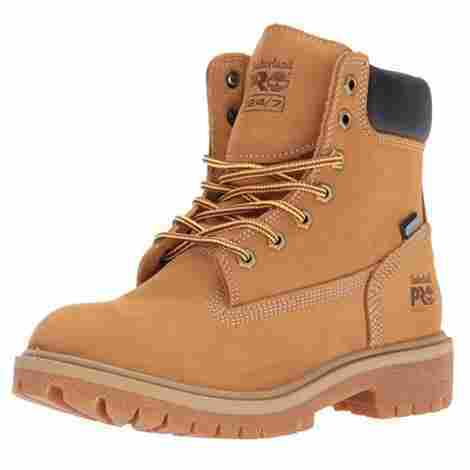 This Timberland boot is available is three colors: black, brown and wheat, and a full range of sizes from 7-15 (US), including wide! You are sure to find a good fit here. A comfortable, good-looking boot is not hard to find when you look at Timberland. Skechers? They make boots? That's what we said, but the answer is a strong yes, as shown by the Skechers for Work Women's Steel Toe Boot we looked at. Three colors and a wide range of women's sizes from 5-11 (US) in both medium and wide mean there is one out there for you! It's a great looking boot you'll be very pleased to wear. Skechers Relaxed Fit design means more comfort for your money. The relaxed fit means it has a little more room to keep your feet from feeling like they were squeezed in a vise by the end of the day. A memory foam cushion pads your soles and helps reduce the fatigue of hours on your feet. Padding around the collar and the tongue avoid chafing your ankles as you move. These are not just comfortable, safe footgear, they look good too. A traditional design means they will last and last, but still protect you. The toughest work environment is no match for you, your shoes should keep up with you! These attractive, durable boots will do just that. You'll have no worries while wearing the Skechers 76561 steel toe boot. Amazing! This high-quality boot comes in just a bit cheaper than most. That's an unexpected bonus. We thought they's be quite a bit pricier, but to our pleasant surprise, they are moderately priced. For what you pay, you would not expect the boot you get. And in today's world that's a huge plus! We are happy to place this boot on our list. It's a great value! The 100% leather Timberland WP INS-W Women's Pro steel toe boot adds 200 grams of insulation to keep your feet warm on the coldest days. Sizes from 5.5-11 (US), with half sizes up to 9.5 are available in both medium and wide sizes. It comes in one color, Wheat Nubuck Leather. At work or at home, standing on cold ground or concrete can by distracting, or even painful as the heat leaves your feet! Keep your mind on your job with the Timberland Pro insulated 6-inch women's steel toe boot. Comfort is queen when you put on this boot. If you work in demanding environments, this shoe is for you! Hard time making choices? This one's simple. Comfort, safety and warmth in one, count 'em, one color: wheat nubuck leather. 100% leather construction in this boot as that color implies. Sizes though, that's where you want and need choices. This boot has them to please a crowd, from 5.5 to 11 (US), and half-sizes up to 9.5! Coupled with the medium and wide widths, there is a shoe for almost every foot here. And Timberland designs them and builds them specifically for women’s feet. No more buying men's smaller sizes and hoping for the best. This boot will meet your needs. This boot is at the higher end of our price spectrum, but has additional features that make it worthwhile. You'll love it, and more importantly your feet will love it, and that makes the slight added cost worthwhile. It's insulated, and it is designed with Timberland's 24/7 comfort system, which supports the arch, cushions every step, and helps reduce foot fatigue. Here's another quality 6-inch boot made of 100% leather, the Wolverine Men's Floorhand Work Shoe. With a rubber non-slip sole and cushioned insole, this boot has what you want in safety shoes: strength, quality, and comfort. It can arrive at your doorstep in three colors: black, dark brown, and wheat. Sizes from 7-14 (US) are available in medium and wide sizes. Some sizes are available in extra-wide width, check for availability. The Wolverine brand was established in Rockford, Michigan in 1883. All those years of experience are coming together to bring you the best boot they can. Take advantage of all that experience by giving the Wolverine Floorhand a try. 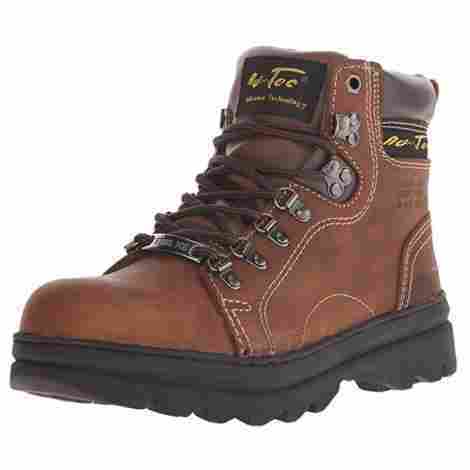 This is a top quality, waterproof, 100% leather boot, with that all-important protective steel toe. Rubber soles! What does that mean? Non-slip gripping soles is what. You are going to work on al kinds of surfaces in these boots: concrete, metal, tile, maybe snow and ice, maybe some mud. Whatever it is, you don't need to be sliding around while you are trying to work. A deep lug tread gives these shoes additional ground-gripping ability. You might not stick like Spiderman, but these boots will help you stay in place. These are moderately priced boots, which you'll feel is a bargain when you see what you get for your money. They'll make you happy in many ways, and that's what you want your expenditures to do! You can find cheaper models in the marketplace, but something is sacrificed to hit the lower price point. In fact, that pretty much goes for our entire list. Most are in the moderate price range, because anything less will not serve you well. Your feet are sensitive and easily irritated, we all know that from previous experience with ill-fitting shoes. Buy good ones, like we've listed here, and you can't go too far wrong. 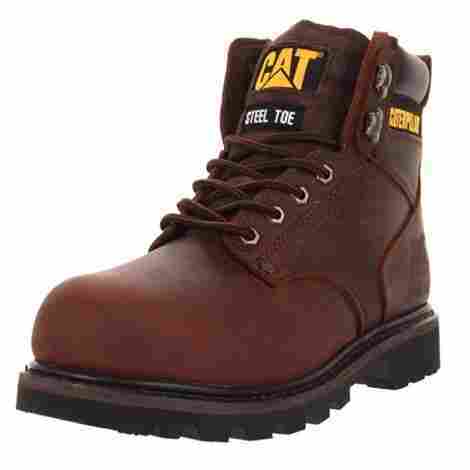 Here is number six on our top 10 rundown of steel toe boots: The Caterpillar ST-W for women. From Caterpillar, the name known around the world for strength, power, and durability, these boots add style to the list. They are available in sizes 4-11 (US), medium and wide widths, and two colors: bark and black. They have a cute plaid padded collar! You may work as hard as anyone, but you don't want to give up your sense of style. These boots help you do that with the nice touch of a plaid padded collar. The rest of the boot is stylish, but strong as can be. 100% leather, waterproof construction, a rubber sole, everything you'd expect for comfort and protection. Caterpillar takes pride in their worldwide reputation for quality, powerful equipment, and they're not risking that reputation here. You'll be pleased with the quality of the leather, the accurate sizing, the non-slip sole, and the overall feel of the shoe. Best of all, they are light enough that you don't feel like you're strapping a bulldozer on your foot! This boot is towards the upper end of our price range, and for that sole reason (get it, sole? we rated a little lower on our list. 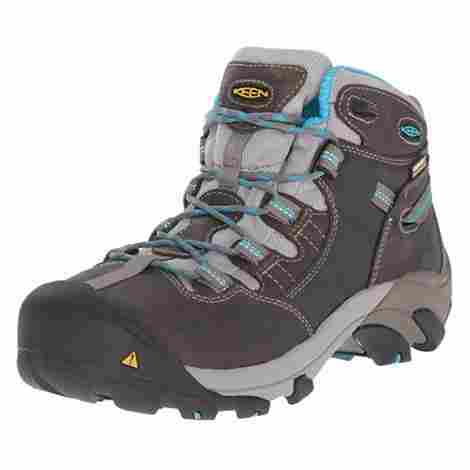 Its quality is unquestioned, but you may find a suitable boot slightly cheaper. That said, we are not unhappy with the boot and its price point, we think it is worth its price and will be a proud addition to your working wardrobe. Don't hesitate if it is your own first choice, it presents a great quality boot for your needs. 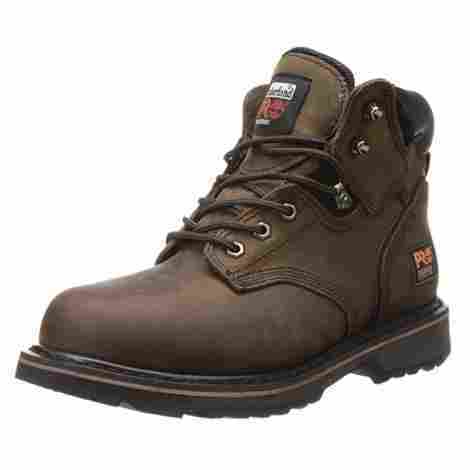 Number 7 on today's list of best steel toe boots is the Dexter Men's Douglas 77160. These boots come in sizes from 6-13 (US), with half sizes and wide widths available. Two colors can be had: black and chamois. Dexter has done themselves proud producing this boot, working folks all over swear by them. Dexter has held the line on cost yet still produced a nice boot that you'll be happy with. Priced low on our spectrum, it's a synthetic leather boot with an oil-resistant lug-tread outsole. The synthetic material of the upper wears well and is strongly water-repellent. Dexter designed in a memory foam insole that insures foot comfort. Memory foam molds itself and conforms to the shape of your foot, eliminating rub points that might otherwise cause blisters. As the name implies, it remembers the shape of your foot and lies ready to cushion it again the next morning. Memory foam is the standard of current sole design. The Dexter 77160 is relatively inexpensive. It represent good value in a synthetic leather boot. If you are looking for boots on a budget, these may be what you need. Our research shows they hold up well, and the sizes are accurate. The synthetic material is lighter than leather, and light boots mean you will have more energy remaining at the end of the day! 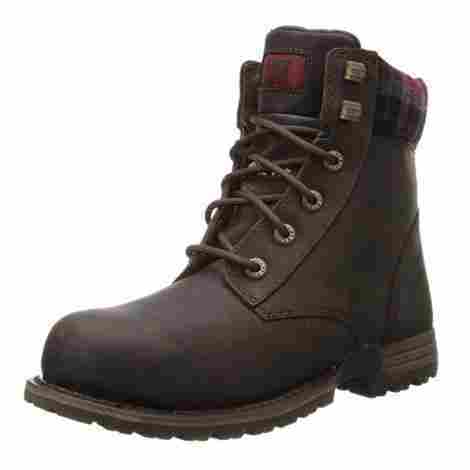 The eighth entry on our list of steel toe boot is KEEN Utility Women's Detroit Boot. A little different from the other boots, it's got some nice color touches, being detailed in the artistically named "Gargoyle" and "Capri Breeze" shades. It an attractive boot, looking more like a casual hiking shoe, and it's available in a full range of women's sizes, including medium and wide widths. The KEEN Utility Women's Detroit Boot will make you feel good as you look good. This boot is designed for women's feet built with a women's specific last. The chic colors are complemented by reflective webbing for an additional safety feature when worn at night. The steel toe boxes use asymmetrical design to match left and right feet, no one-size fits both as you'll find in cheaper shoes. You'll be comfortable whether wearing this shoe in the garage, office, or driving from place to place. The boot includes a removable, memory-foam style footbed that is anatomically designed to cradle your foot and provide the best arch support. That will give you all-day comfort, and increase your productivity by keeping your mind off hurting feet and on your task. You'll feel better at the end of the day, too, and be ready to move on. If you feel slow and footsie at the end of the day, this may be the shoe for you. This boot comes in at a moderate price slightly below the middle of our range. It's a great value, pleasing to the eye, comfortable, and with nice colors. It runs true to size, no need to go up or down a half-size in ordering. Wide widths are available for the asking. You'll not be sorry if you choose this boot. 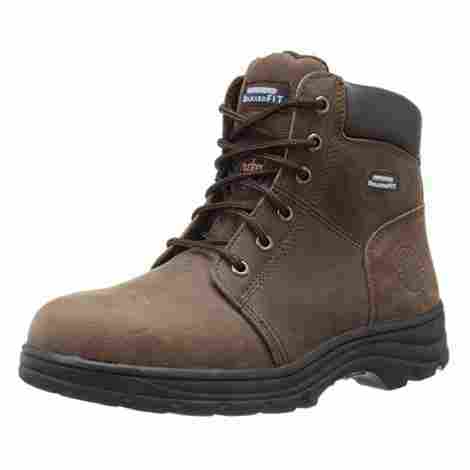 In ninth place on our 10 Best Steel Toe Boots list is the GW Men's 1606ST. 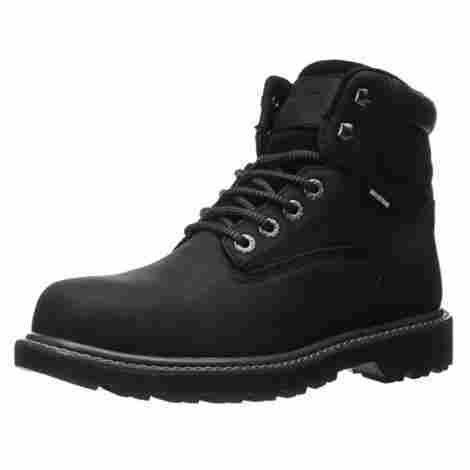 This is a budget boot available in men's medium sizes 6-13 (US) and two colors, black and wheat. The upper is 100% water resistant leather. Every list needs a few budget choices; this boot is at the lower end of our price range. Though inexpensive, it hits all the requirements to be on the list at all. It will do a fine job at what it's designed for, covering and protecting your feet. A slip-resistant sole keeps you stable on your feet. These boots have been worn in all kinds of environments from hot to cold, and still keep on trucking. The durable rubber outsole from Goodyear is a critical piece of this boot's puzzle. The outsole is literally where the rubber hits the road, and a good slip-resistant outsole will keep you safe, and if it's extra durable, the boot will last that much longer. You wouldn't drive your car on bald tires, don't walk on bald shoes! Buy a boot with a sturdy outsole made of quality material, and you'll be glad you did. Extra brownie points for the low price of these boots! You'll be happily strutting to the job when you buy these boots, and have enough left over to buy lunch all week. You need decent boots, but why break the bank if you don't need to? Opt for the GW 1606ST and see for yourself the good dollar/value ratio. This women's steel toe boot from AdTec has a 100% leather upper. It is available in one color, brown, and in women's sizes 6-10 (US) in medium width only. 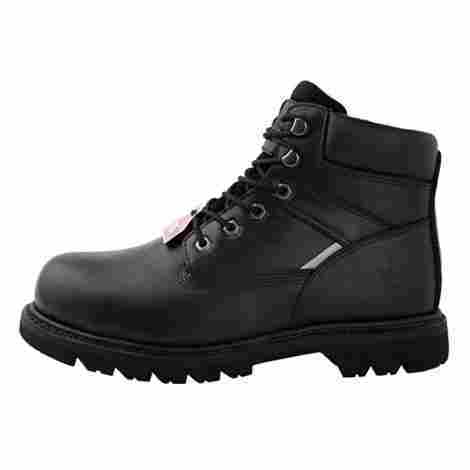 This is a 100% premium leather steel toe boot, with a rubber sole for slip resistance. Additional design features are D-ring lacing and a padded collar to protect your ankles. This boot may be in last place on our list, but you won't be unhappy with its low price point and good materials and workmanship. AdTec has produced millions of shoes since 1981, choosing a shoe from a maker with decades of experience will show you what can be done on a budget. The advanced technology in these shoes belies the low price. Oil-resistant outsoles give long life and reduce the chance of slips and falls. The D-ring lace system make them easy to put on and take off. The 6" height protects your ankles from blows to the side, and a steel shank supports and protects your foot. The boots are a value purchase at the lower end of our range. We think that they represent a good dollar/value ratio. The budget-minded buyer will find what she needs here when shopping for a steel toe boot to keep safe and happy feet. Don't hesitate based on price, these are good quality boots. You might not think of it this way, but a boot is just another tool. They help you get done what you need to get done. Like pliers are an extension of your hand, and a jack is an extension of your arms and back, boots are an extension of your feet. They protect your feet and make them stronger, enabling you to do more work, better work, and faster work, all without sacrificing safety. That’s why we recommend good quality boots, just like all the other good quality tools you need. We looked closely at all the information we could find to develop the list above. When we looked over the boots on our list, and others that didn’t make it, we looked first to materials. We looked for nice, 100% leather uppers as our first choice. Leather is durable, comfortable, and conforms to the shape of your foot. An oil-resistant, non-slip rubber outsole was another marker of quality and safety. In the home garage or out at work, you walk through all kinds of terrain, on all kinds of surfaces, and may encounter oil or gas spills as you go. You boot needs to resist slippage, and not be damaged by exposure to oil products. Oil-resistance will greatly increase the longevity of your investment, and help protect the irreplaceable: your feet! Value is the next thought we have when analyzing a product. If a boot is too expensive for what it is, obviously it’s off the list. That’s our job, sorting out the good, the bad, and the ugly. We look carefully at materials and workmanship and consider what you, our dear reader, need and want in a boot, or any kind of product we review. If it’s not making the grade, regardless of price, it’s off the list. The best dollar/value ratio is our goal, sun-up to sun-down. We looked carefully for boots that run true to size, to keep you from having to experiment to get a pair that fit your feet. We also like, nay, love, boots that come in a deep assortment of sizes and widths. There’s nothing worse than finding the shoes that just speaks to you, only to find your size is not available. Do get your feet measured from time to time. We have discovered our feet seem to be getting a bit larger with age. Your accurate size ten years ago might not be so good today. We don’t know why but its just something we’ve noticed! Soles. Soles are the rock-solid bottom of your footwear experience. If your soles are not up to what you expect, then your soul will not be a happy one! Always look for that high-quality, rubber sole. Other man-made materials are good too, but be sure to read and compare to get something that will wear well and protect you from slips & falls. Most injuries in the workplace come from falls, and the chance of falling increases as you age (there’s that age thing again, we just can’t win). Protect yourself with a slip-resistant sole, and a strong lug pattern tread as well, you’ll be glad you did. Two thumbs up if your boots are attractive, protective, comfortable, and last for years! We, like you, look for quality durable materials in our boots. 100% leather and the aforementioned rubber outsole are a great start. The stitching and workmanship affect how long your boot will hold together, and its service life. Spreading a boots cost over a long period of time raises that value mark even higher, so we look for the best materials in use, even in the most humble of products. My feet don’t have eyes, I’m assuming yours don’t either! We all have our eyes, though, and we have our preferences and desires when it comes to color. Maybe you just like a particular color boot, or maybe you want one that hides marks and stains, or is easily cleaned. Whatever the reason, it’s best to have a choice when it comes to color. We tried to list models that had a choice for you when it came to color. You want comfortable boots; we want you in them. The better-rated lots we looked at had wide widths available. We all had that experience of cramping our feet into too-narrow shoes, wondering who on earth has feet so small. When it comes to day-to-day footgear like these steel toe boots, you can’t afford discomfort, and one of the better ways to avoid it is to choose boots that fit well. We want to make sure you can find a good fit once you select a boot from our list, and having a range of widths available helps ensure that. The manufacturer’s reputation is a factor to consider. Your chances of getting the best, most durable, and well-fitting boot increase if you buy from a manufacturer with a good reputation. We are not brand snobs, but a good brand usually indicates a good product with good support. We won’t turn our noses up at what we think is a good value though, we are always open to new and exciting products from innovative new manufacturers. Q: What’s the difference between an outsole and an insole? A: An outsole is the bottom of the shoe, the part that hits the floor, or ground, or whatever you are walking or standing on. A dress shoe outsole may be made of leather like the upper; a workbook outsole should be made of made of natural rubber or a durable synthetic material. The insole is that part that the bottom of your foot rests on, inside the shoe. Soft, conforming materials to cushion and support your foot are the best materials here. Modern insoles are frequently made of a memory foam material that remembers your foot’s shape. Q: I’m a girl, can I wear a men’s size boot? A: Of course! Just like any other shoe, convert the size appropriately and you’ll be able to wear them. The women’s models we’ve listed for you above should give you a superior fit since they are designed for the unique nature of women’s feet. We think the wide variety of women’s boot should make it unnecessary to settle on a men’s size. If that’s what you want though, size them well and you should be just fine. Q: Can you wear them in the snow? How about in a polar vortex? A: Most boots should do well in the snow. A strong tread design will help maintain good traction. If you are going to be outside in the cold a lot, look for insulated boots. You might even buy them a little larger, leaving room for thicker socks. When the polar vortex comes, just limit your time outside, and be careful to avoid frostbite. Listen to your body, and remember your feet are the closest thing to the frozen ground during the winter. Q: Are steel toe boots heavy? A: Steel toe boots aren’t ballet slippers by any means, but they are not as heavy as in the old days. Manufacturers know that lighter, stronger technology is what consumers want; all-day comfort in any shoe is an unmatched selling point. The latest designs in steel toe boots use high-tech processes to yield a lighter product than ever before, keeping you on your feet and productive that much longer. Q: All your listed boots are six-inch boots. Are there taller or shorter ones? A: Yes. There are eight inch and even taller boots, and there are low-rise steel toe shoes. We like six-inch as the best all-around size for comfort and protection. If you are a professional lumberjack or high steel worker, you may need the additional protection of a taller boot. If you work in an indoor setting but want steel protection, a low-rise shoe may be great for you. We do like the six-inch size for general use, though.